It has been a great response so far. We hope, this ILP proves to be much bigger and better in terms of content quality and reach, touching thousands of aspirants devoid of coaching and proper guidance. Smart and Hard Work=IASbaba + You—-> Success Guaranteed! There is no deadline to join ILP and All India Prelims Test Series. One can join anytime. If you pay online through instamojo, ID activation will take few hours. So do not panic. Once you receive payment slip, send it to ilp@iasbaba.com and wait for our reply. If you pay offline or NEFT- send us the payment details and wait for our reply. How will ILP help me in preparing Prelims and Mains and Interview? First go through the sample 3 Months Plan of ILP 2018 carefully. What is Value Add Notes and how will it be helpful in my preparation? What is Babapedia and how is it helpful? Understand that newspaper articles are not written for your exam + it takes lot of time to extract required content on daily basis + and do background research to cover news articles relevant for you. Here comes babapedia as a savior. How many Prelims Tests in ILP, is CSAT part of ILP and how about revising them? Will you review our Mains answers in ILP? How will it be helpful for Fresher and Working Professionals? ILP is known for its high quality content and planning. 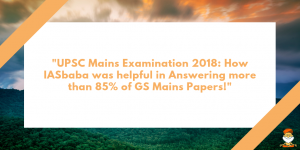 Its quality components like Value Add Notes, Babapedia for Current Affairs, Block Wise Planning and High Quality Prelims Tests and Mains Mocks not only saves your effort but will provide you required direction to crack this exam sitting at Home. Being a Working Professional I hardly get few hours in a day. How will I manage with this plan? With or without ILP, you will prepare- Isn’t it? With ILP- Defined Planning + Quality Content + More Time to focus on Optional + More Productivity+ Step Wise Learning from scratch. What all sources to refer in ILP? What is All India Prelims Test Series (AIPTS) in English and Hindi, is it different than ILP? AIPTS is Prelims only Test Series Programme for 2018. It will be available in both English and Hindi language. It has a total of 41 Tests. 31 for General Studies and 10 Full Length Tests of CSAT Paper 2. Check the Full Plan of AIPTS given above. Why All India Prelims Test Series- AIPTS, kept outside ILP 2018, will Questions be same in AIPTS and ILP? ILP already have 35 High Quality Tests for practice. ILP Students can join AIPTS after December in case wish to solve more tests (personal choice). Questions will be different in ILP and AIPTS, so that ILP users can also make best use of it. Join AIPTS only after sincerely following ILP for few months. Take the tests of AIPTS subject wise for revision purpose. Will you provide Ranking, Analysis of Tests, Downloadable Solutions and Questions after the Test and for how many times can I appear for each Test in ILP and AIPTS? Yes, detailed analysis of your performance + All India Ranking + PDFs of Question and Solution+ Discussion on Questions on Test Platform + 3 Attempts for Each Test for both ILP Tests and AIPTS. Is there any deadline to join ILP and AIPTS? Being a working professional I may not be able to appear for Tests on time. What to do? One can appear for the Tests till 3rd June 2018, next Prelims. Tests are flexible in nature and you can appear anytime as per your convenience. so need not worry. What all will be there on ILP Platform and can I download the Value Add Notes? ILP Platform will have a close group of sincere aspirants’ part of ILP 2018. It will have full guidelines for next one and a half year of preparation journey. Value Add Notes– On this page you will get all VAN updated as mentioned in the plan. Yes it will be downloadable. Is ILP and AIPTS available Offline also? ILP is an Online Programme. How to Pay or Join? Offline Payment Details: Please mail us the acknowledgment at ilp@iasbaba.com if making offline payment.